Before I start my blog today, I wish to pay my respects to our oldest and longest Leeds United fan Edna Newton, who died this week aged 94 years. Having a season ticket for 64 years was a fantastic achievement and the game needs more fans like her. It was a proud moment seeing my photo on the scoreboard on the 64th minute signalling the whole ground to start giving their applause to celebrate her lifelong support of Leeds United. RIP Edna. The WACCOE message board I frequent had organised some flowers for Edna to be placed at Billy’s statue which was a lovely gesture. Also Leeds United put flowers on her seat with a Leeds scarf around them which is another heartwarming gesture. It is also the nearest home game to Armistice Day and the 100 year anniversary of the Battle of the Somme. So many died in the wars and seeing the horrendous conditions in the trenches in the First World War brings a lump to my throat. The poignant Last Post played by the bugler always gets to me. To all those soldiers who gave their tomorrows so we could have our today, I salute you. With a slightly later set off time than normal, I thought it would be a good idea to go to the White Rose en route to Elland Road with Danielle my daughter and granddaughter Laura. With queues of traffic everywhere, we were lucky to get a parking spot despite there only being a few vacant. I never expected it to be like that so I’ll avoid daytime shopping if I can in the future as I hate it being crowded. Give me a football crowd any day! I actually prefer 5.30 pm kick offs to the lunchtime ones and on arrival at the packed Peacock, everyone was in good spirits. With fans having longer before the game it contributed to the atmosphere and I tried capturing a new song that some lads were trying to get going by video. It was good to catch up with friends although only for a short while before we headed in to the ground. Having looked for the Leeds United Supporters Trust collecting food for Leeds south and east foodbank, I found them on the way in so well done to them. The team: Peacock-Farrell, Ayling, Dallas, Cooper, Jansson, Hernandez, Alioski, Klich, Phillips, Roofe and Forshaw. Subs were: Pearce for Ayling (went off injured) (25), with Clarke replacing Pearce (65) and Saiz for Phillips (65). The game ended in a 1-1 draw with Roofe equalising in the 84th minute. Attendance was 34,308 with 1,766 Forest fans. After taking photos at the bottom of the steps I made my way to my seat to find out that I nearly didn’t have one! A man and woman had been sat in our season ticket seats when the other two got there. When Danielle had said they were in our seats they weren’t for moving but one eventually did. They’d been overheard saying that if anyone asked them to move they’d be told to f**k off. I’m pleased to say that my seat had been vacated by the time I got there! It took me 10 minutes to realise that Dallas was playing at left back again which I wasn’t exactly enamoured about. It made me think back to the Guiseley pre-season game when Dallas scored two goals from the left hand side. Maybe that’s behind Bielsa’s thinking but whilst I’ve no problem him going forward I don’t like seeing him in defence. It was just after this realisation that Forest took the lead from a corner which meant we faced an upward battle again to get back on level terms. The Leeds crowd didn’t let being a goal down deter them from keeping a good atmosphere going though. Ayling went down after being fouled and although he got up again he only lasted a few minutes before being subbed. Looks like another big injury sadly but as long as it isn’t a repeat of last year’s game against Forest which ended his season. Once they’d taken the lead Forest started the time wasting tactics and when their man went down in the penalty area I thought he was feigning an injury. As he headed to the dugout rather than straight out to the touchline, I was just going to berate him but realised he was being subbed! Although we had a couple of chances, we didn’t really test the Forest goalie which was a contrast to the Ipswich game, with the amount of saves their goalie had to make. The second half saw Forest still leading as Leeds ramped up the pressure. With the fans becoming the twelfth man and getting behind the team with WACCOE reverberating around the ground, we waited for a double substitution to be made when my photo of Edna came on the scoreboard. The applause for her was unanimous and I’m sure she’d have loved hearing the applause she received. I was surprised to see Pearce himself a sub taken off but realised he’d pushed Alioski back and brought Jack Clarke on. He had an immediate impact when he put a low hard cross across the box which was crying out for someone to knock it in at the far post. We had an immense amount of pressure as Leeds tried their hardest to get an equaliser. The ball many times wasn’t falling kindly for us and I always felt like Forest would be a threat. I felt that as long as we kept them out and didn’t give them a second we could get a goal and go on to win the game. The equaliser came in the 84th minute with Saiz, Dallas and Klich involved before Roofe put the ball into the net to send the volume of eruption from the Leeds fans into overdrive. As we were heading back to the centre circle I saw their goalie remonstrating with the linesman and claiming handball. As the referee headed over to the linesman we waited with bated breath until he signalled to the centre spot. That was a relief but I just thought it would have been carnage if they’d have disallowed it! Replays have apparently shown it was a ball to hand but it’s about time we’ve had the rub of the green and the decision going our way for once. We had to settle for a point in the end but am happy to take that as it is better than a defeat. The one thing that we must do better is from our corners; we have to start beating the first man which for some reason we cannot do more often than not. I don’t like short corners but I could see why we resorted to them at times! 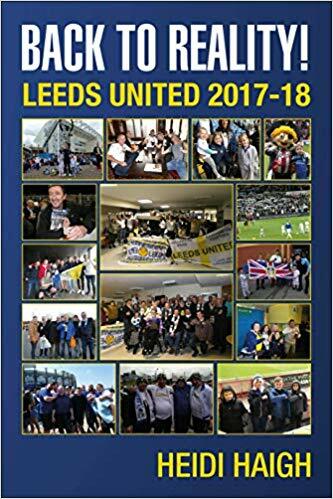 Thank you to Debbie and James for buying my new book Back to Reality, Leeds United 2017-18. With many fans saying they hadn’t appeared in my photos as yet including the original Donny Whites that was remedied today! The latter may shout at me though as I wobbled so they’ll have to ask me again next time they see me. As usual, many of our Scandinavian friends were in attendance, our Irish fans plus we had some Utrecht fans visiting too. With plenty of others in attendance including our long distance south coast regulars, it was nice to meet up with others after the game. Having just read that Rita our Leeds United guide dog and Nikki had an altercation with a Forest fan taking his anger out on them all I can say is shame on you. How dare you attack them because that is nothing more than disgusting! On hearing there has been a helicopter crash at the King Power Stadium Leicester after their game, things aren’t looking good after it burst into flames on impact. Sad times for their club. We have a good break now with our next game being against Wigan for the Sunday lunchtime kick off. With another large following heading there with tickets once again sold out in minutes, I hope we can do better than we did at Blackburn. See you there, LUFC – Marching on Together!